The majority of Trione-Annadel State Park has been closed in October 2017 due to damage from the Nuns Fire. 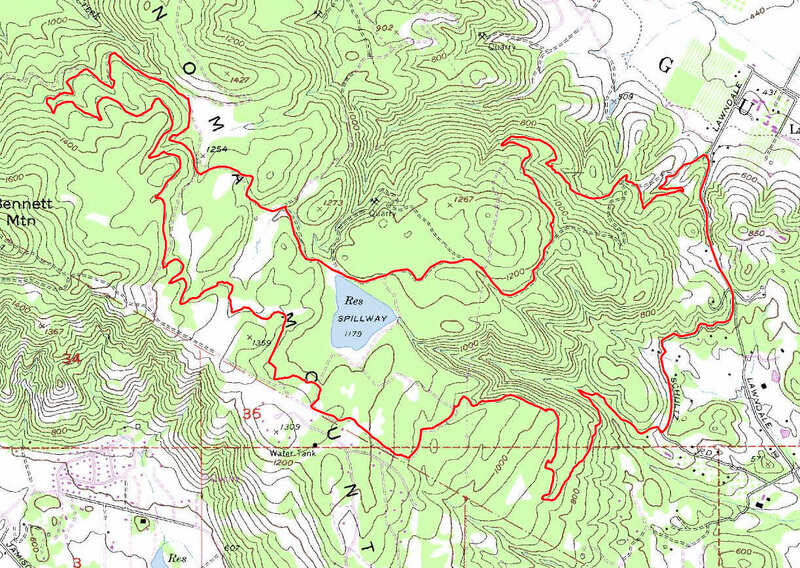 Those parts of the park probably won't be reopened very quickly and, even when they do, it's not guaranteed that the trail network in that portion will remain unchanged. This eliminates the entire ride route you see on this page. See the park's website at the link on your left for the latest updates. Parking is subject to a fee at Annadel State Park if you park somewhere past the main entrance booth of the park on Channel Drive. This ride happens to start at a trailhead on the southeastern boundary of the park that has free parking. This loop includes almost all of the noteworthy trails in the "eastern" half of Annadel. (The only one left out would be Two Quarry Trail.) This includes the entire length of both Ridge Trail and Lawndale Trail; both of them excellent singletracks. Of the ride's total length, about 1.3 miles is on paved public roads, a half mile or so is on a fire road, and the rest is all on beautiful singletrack trails. This ride starts from the small parking lot at the trailhead for Lawndale Trail, quite simply because there's no other parking available anywhere else on Lawndale Road or Schultz Road. Therefore, the ride begins with a paved "approach" portion that takes you to the trailhead of Schultz Trail. Schultz Trail is mainly a forested singletrack climb at a reasonable grade, at least initially. It also includes a (fairly sharply dipping) creek crossing in this portion that looks like it might have water year round. (I did this ride in early spring; it's hard to be sure.) It later turns into a rocky and more exposed singletrack; effectively like most of Ridge Trail. The very beginning of Ridge Trail is a foot-wide singletrack through grass. It doesn't stay that way for very long, though. It quickly becomes a moderately wide rocky singletrack with frequent rock gardens and remains that way for most of its length. Parts of it look more like a doubletrack, actually. Perhaps I should say "unfortunately", because this seems to arise from riders navigating over the grass to avoid the muddy or overly rutty parts of the trail. But riding Ridge Trail is a lot of fun, although arguably a little more so when done in the other direction. Most of the western reaches of this loop have the most tree cover and possibly a little fewer rock gardens. Once you're past the fire road portion of the ride on Marsh Trail, you pretty much repeat everything in the beginning part of the ride in reverse order; rocky technical singletrack, leading to more of a forest singletrack that's comparatively smoother. Lawndale Trail starts out as a fire road. Almost immediately after the point where the trail turns into a singletrack, it greets you with a section that looks more like a creek bed than a trail. And there are a few more of those on your way down. But the second half of this descent is under pretty dense forest cover. When I did this ride in early spring, there were numerous large fallen trees and mini slides blocking the trail. Some of these were difficult even to scramble over. I'm not sure how common this is during this part of the year, but given the density of the trees in this part of the ride, I'd be surprised if there weren't at least one or two of these every year.